Test yourself on the highway code with these 43 questions from the DVSA revision question bank on documents including: licences, MOT certificates, theory tests, SORN, fines, vehicle registration, and insurance. The average score for this test is 85%. Can you beat that? The aim of the Pass Plus course is to build up your skills and experience. It is recognised by some insurance companies, who reward people completing the scheme with cheaper insurance premiums. Until the vehicle is insured and MOT’d. A SORN declaration allows you to keep a vehicle off road and untaxed. SORN will end when the vehicle is taxed, sold or scrapped. The Pass Plus scheme can be taken after you’ve passed your practical driving test. Ask your ADI for details. It is designed to improve your basic driving skills. By successfully completing the course you may get a discount on your insurance. Every vehicle used on the road has a registration document. It shows vehicle details including date of first registration, registration number, previous keeper, registered keeper, make of vehicle, engine size, chassis number, year of manufacture and colour. Helping someone to drive is a responsible task. Before learning to drive you’re advised to find a qualified Approved Driving Instructor (ADI) to teach you. This will ensure that you’re taught the correct procedures from the start. When buying or selling a vehicle. When a police officer asks you for it. When having an mot inspection. You MUST be able to produce your valid insurance certificate when requested by a police officer. If you can’t do this immediately you may be asked to take it to a police station. Other documents you may be asked to produce are your driving licence and MOT certificate. The vehicle you drive must be roadworthy and in good condition. If it's over three years old, it must pass an MOT test to remain in use on the road (unless it's exempt from the MOT test - see GOV.UK). The cost of insurance varies with your age and how long you have been driving. Usually, the younger you are the more expensive it is, especially if you are under 25 years of age. The Pass Plus scheme provides additional training to newly qualified drivers. Pass Plus is recognised by many insurance companies and taking this extra training could give you reduced insurance premiums, as well as improving your skills and experience. If you want to keep a vehicle off the public road you must declare SORN. It is an offence not to do so. You then won’t have to pay road tax. If you don’t renew the SORN declaration or re-license the vehicle, you will incur a penalty. The vehicle excise licence (road tax) can be renewed at post offices, vehicle registration offices, online or by phone. When applying make sure you have all the relevant valid documents, including a valid MOT test certificate where applicable. The licensing authorities hold the records of all vehicles, drivers and riders in Great Britain and Northern Ireland. They need to know if you have a medical condition that might affect your ability to drive safely. Don’t risk endangering your own safety or that of other road users. This is a method used by insurance companies to keep annual premiums down. Generally, the higher the excess you choose to pay, the lower the annual premium you will be charged. Your vehicle MUST have valid insurance cover before you can tax it. If required, it will also need to have a valid MOT certificate. You can tax your vehicle online, by phone or at certain post offices. The licensing authority need to keep their records up to date. They send out a reminder when a vehicle's excise licence (road tax) is due for renewal. To do this they need to know the name and address of the registered keeper. Every vehicle in the country is registered, so it’s possible to trace its history. If your vehicle is required to have an MOT certificate you will need to make sure this is current before you are able to renew your vehicle excise licence (road tax). You can renew online, by phone or at certain post offices. Learner drivers benefit by combining professional driving lessons with private practice. However, you need to be at least 21 years old and have held your driving licence for at least 3 years before you can supervise a learner driver. The minimum insurance required by law is third party cover. This covers others involved in a collision but not damage to your vehicle. Basic third party insurance won’t cover theft or fire damage. Check with your insurance company for advice on the best cover for you and make sure that you read the policy carefully. After passing your practical driving test you can take further training. This is known as the Pass Plus scheme. It is designed to improve your basic driving skills and involves a series of modules including night time and motorway driving. The sort of things you may not have covered whilst learning. Novice drivers are much more likely to be involved in a collision than experienced drivers. The Pass Plus scheme gives structured training to help new drivers improve basic skills and widen their experience. Approved Driving Instructors (ADIs) will be able to advise of the benefits. It is your legal responsibility to keep the details of your Vehicle Registration Certificate (V5C) up to date. You should tell the licensing authority of any changes. These include your name, address, or vehicle details. If you don’t do this you may have problems when you sell your vehicle. Having an excess on your policy will help to keep down the premium, but if you make a claim you will have to pay the excess yourself, in this case £100. Third party insurance doesn’t cover damage to your own vehicle or injury to yourself. 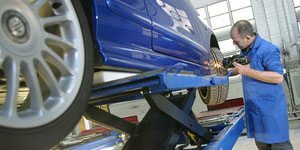 If you have a crash and your vehicle is damaged you might have to carry out the repairs at your own expense. New drivers are far more vulnerable on the road and more likely to be involved in incidents and collisions. The Pass Plus scheme has been designed to improve new drivers’ basic skills and help widen their driving experience. If you accumulate six or more penalty points within two years of gaining your first full licence it will be revoked. The six or more points include any gained due to offences you committed before passing your test. If this happens you may only drive as a learner until you pass both the theory and practical tests again. This type of insurance cover is usually cheaper than comprehensive. However, it doesn’t cover any damage you cause to your own vehicle or property. It only covers damage and injury you cause to others. Sometimes an insurance company will issue a temporary insurance certificate called a cover note. It gives you the same insurance cover as your certificate, but lasts for a limited period, usually one month. You don’t have to carry the documents for your vehicle around with you. If a police officer asks to see them and you don’t have them with you, you may be asked to produce them at a police station within seven days. Driving a vehicle without insurance cover is illegal. If you cause injury to anyone or damage to property, it could be very expensive and you could also be subject to a criminal prosecution. You can arrange insurance cover with, an insurance company, a broker and some motor manufacturers or dealers. If your vehicle requires a current MOT certificate you will be unable to renew your vehicle excise licence (road tax) without it. Reduce the cost of your driving licence. Prevent you from paying congestion charges. Allow you to supervise a learner driver. The Pass Plus scheme provides a wide range of driving experience accompanied by a qualified instructor. There is no test and when completed you may get a reduction in insurance costs. It can help to improve basic skills, reduce the risk of having a collision and make you a safer driver. When driving the car with the owner’s permission. • drive vehicles that are more than 40 years old without an MOT test, but they must be in a roadworthy condition before being used on the road. See GOV.UK for more details. As the registered keeper of a vehicle it is up to you to inform DVLA (DVA in Northern Ireland) of any changes in your vehicle or personal details, for example, change of name or address. You do this by completing the relevant section of the Registration Certificate and sending it to them. Before you drive on the road you MUST have a valid provisional licence, for the category of vehicle that you’re driving. It must show your signature, it isn’t valid without it. The Pass Plus scheme was created for newly qualified drivers. It aims to widen their driving experience and improve basic skills. After passing the practical driving test additional professional training can be taken with an Approved Driving Instructor (ADI). Some insurance companies also offer discounts to holders of a Pass Plus certificate. As well as being at least 21 years old you must hold a full EC/EEA driving licence for the category of vehicle being driven and have held that licence for at least three years. By making a SORN, DVLA will know that this vehicle is being kept off the public road and does not need vehicle excise duty to be paid. Once you have made a SORN, it remains valid until you tax, sell or scrap the vehicle. It is your responsibility to make sure you are properly insured for the vehicle you are driving. It is a serious offence to drive without insurance. As well as a heavy fine you may be disqualified or incur penalty points. When you take out motor insurance you’ll be issued with a certificate. This contains details explaining who and what is insured. If a police officer asks to see your insurance certificate you must produce it at the time or at a police station within a specified period. You also need to have current valid insurance when renewing your vehicle excise duty (road tax).